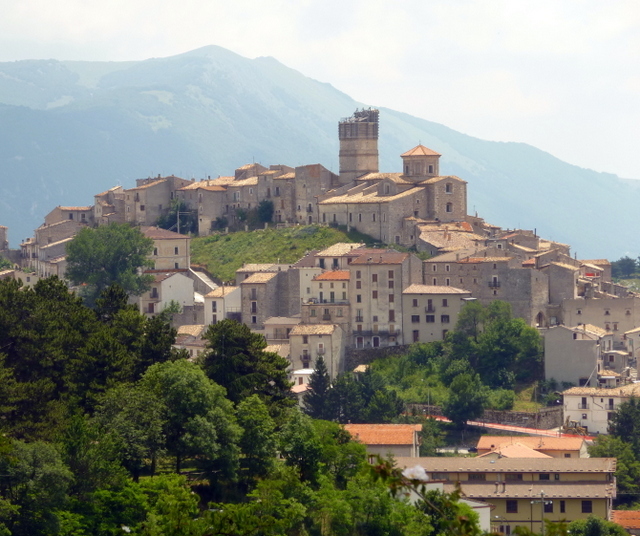 Another cute Italian village, Castelli nestled in the Gran Sasso. 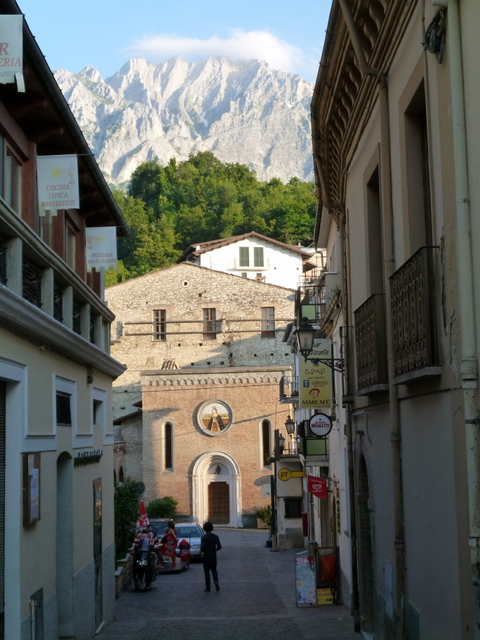 Santo Stefano was only the beginning of our long weekend in Abruzzo. Do you ever yearn for deserted roads? How about hiking trails with no oncoming foot traffic, nor any foot traffic at all for that matter? 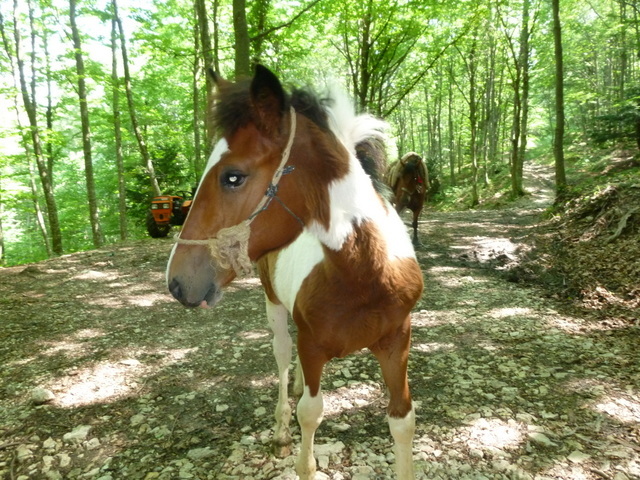 Have you encountered ponies in the woods? Or restaurants where you pay half of what you’d pay in the big city? Plus lovely people delighted to help you practice your Italian and artisans of magnificent pottery? Welcome to Abruzzo, in particular, welcome to Castelli. Castelli is known for its ceramics, but is less famous – and less touristed – than the Tuscan destination of Deruta. We learned of Castelli quite by accident. 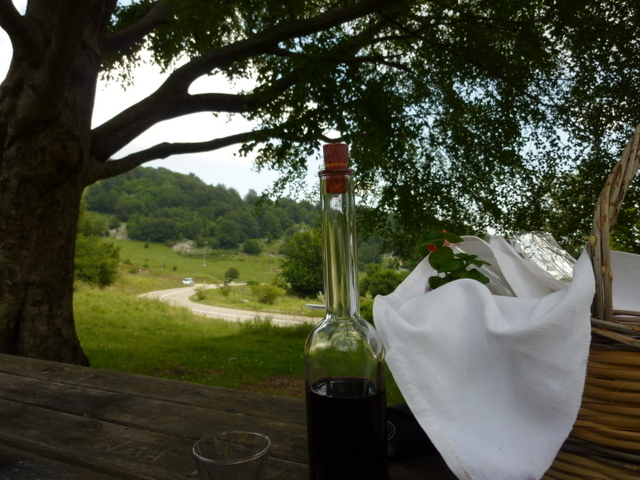 In May, on our way home from Puglia we decided to spend a night in the mountains. On that trip, we selected a hotel in the tiny hamlet of Ornano Grande, right beneath the highest peak on the Italian peninsula, the Corno Grande. Il padrone of the hotel told us we had to go to Castelli before we left the area. “Bellissima” he said, and he was right. It is rated as one of the most beautiful villages in Italy. That brief taste convinced Ric and I we had to return to Abruzzo and to Castelli. Then, in what can only be described as a happy coincidence, when we mentioned this lovely place to an Italian friend he said, “That’s my mother’s home!” So with an insider’s knowledge we were directed first to Santo Stefano and then to Castelli and environs for continued rest and relaxation. 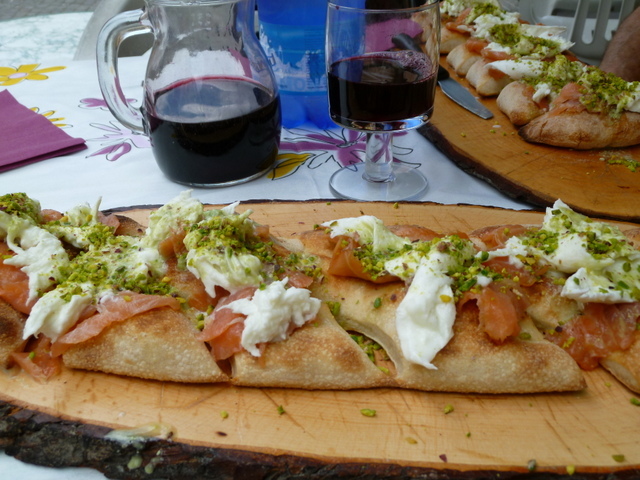 Abruzzo is not the pizza capital of Italy, but this salmon, mozzarella and pistachio pizza was to die for. ceramicists. The views are amazing and the town has a great “hang out” factor, but lodging is not abundant. There are a few agriturismos in the area, and the Parco Nazionale Gran Sasso has a resort hotel nearby, but we wanted to be more in town. Luckily we found B&B Vecchio Mulino (Old Mill). There Luciana made us welcome at her modest but pristine home. Originally a mill, 13 years ago it was remodeled into a five room B&B. A quieter place does not exist. Only the babble of the nearby stream and the occasional crow of her rooster provided background noise. Old Buc, her dog, quit barking once he knew we were guests, and the new kitten kept us entertained. Goats, horses, chickens, and bees round out the livestock, and Luciana puts her homemade acacia honey on the breakfast table each morning. As it was in a jar equipped with a pump, I almost had to restrain Ric from squirting it directly into his mouth. Once again, we slept for 9 hours each night. 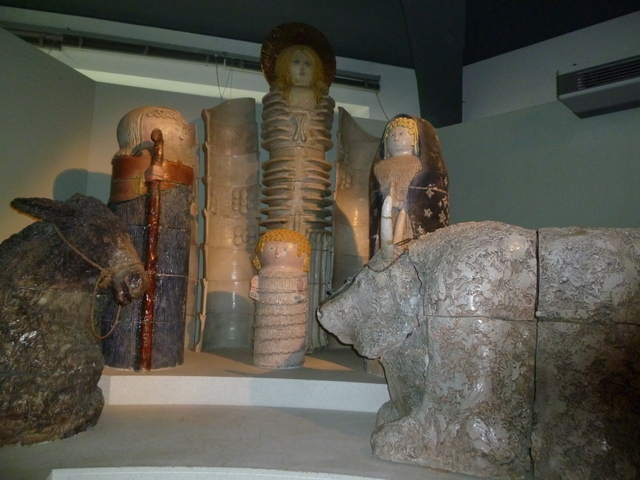 Castelli ceramics institute: gigantic nativity figures. Absolutely stunning in person. We hiked, we shopped for ceramics, and we ate too much: A perfect getaway! The residents were only too happy to help us find our way and enjoy the treasures of the area. One man, a ceramicist, encouraged us to go to the Istituto D’Arte “F.A.Grue” Castelli (Institute of Ceramics) just up the road. This is a 107-year-old institution that attracts students and artists from all over. When we saw him later in the day, he we very disappointed we had not seen it – yet. In fact, when we tried to go there it seemed closed. By now it was almost 7:00PM, but he phoned his sister, who works at the school and arranged a private tour for us. It was truly a highlight! Only 2 hours from Rome, we’ll go back for fresh, cool mountain air. Forest hiking, beautiful views, and the welcoming Abruzzese people again when we get a chance. Following are a few pictures from the region. 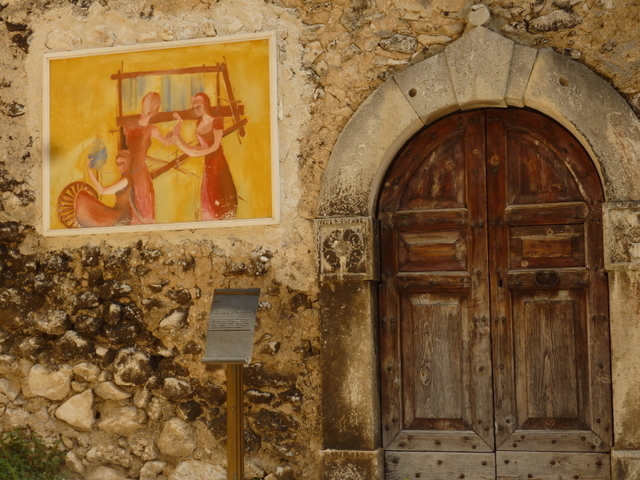 There are two Castel del Montes in Italy: a true castle in Puglia and this charming town in Abruzzo. It suffered damage in the L’Aquila earthquake. Lovely fresco in Castle del Monte. 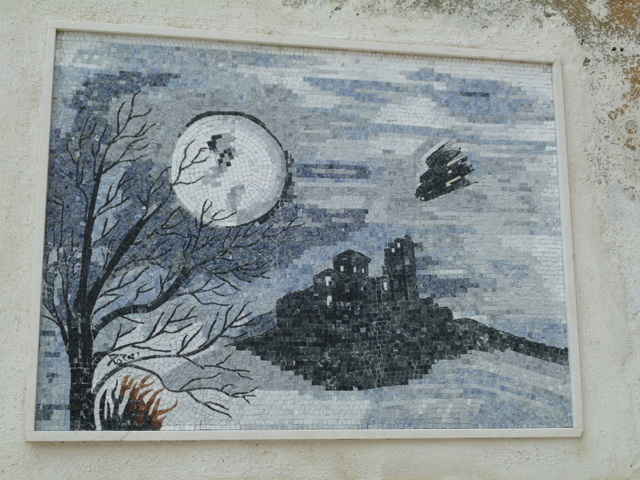 Mosaic inlaid in a wall in Castel del Monte. Roadside picnic stop in Abruzzo, on our way to Castelli. A herd of cattle relaxed, unencumbered by a fence, just around the corner. This little guy was looking for apples or carrots…. Acted more like a puppy than a pony. I didn’t get a great shop of this work in progress. The pony kept getting in the way. 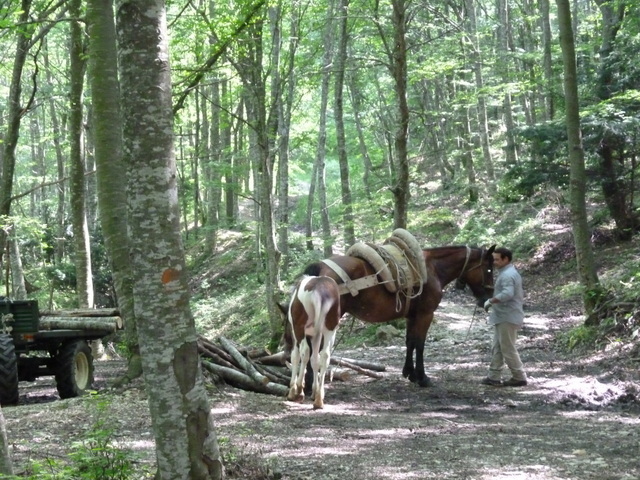 Mamma horse was hauling firewood out of the woods. So beautiful and serene! What a perfect holiday! Your blog makes me feel like I am there….and wanting to see, hear, taste, smell, touch it in person!